Everyone wants to know how to eat healthy on a budget but many don’t know how to create a healthy grocery list. 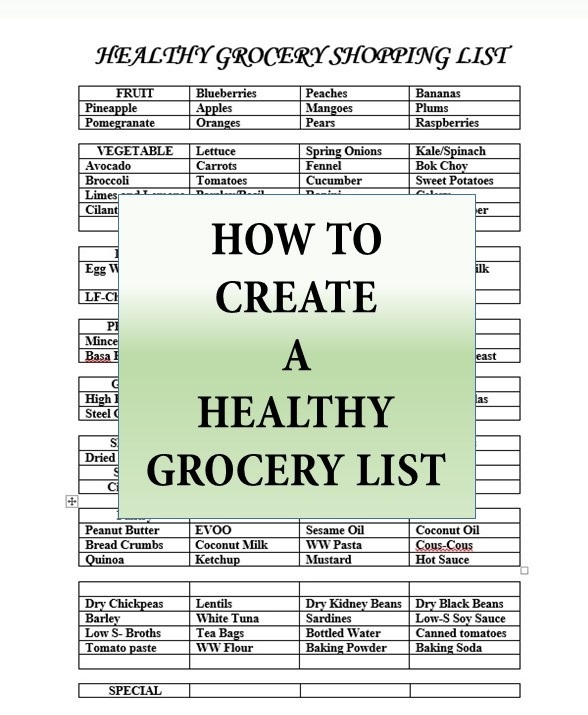 Today I’m going to share with you just how we go about creating our healthy grocery list. Lately I’ve noticed many people visiting CBB looking for a healthy grocery list or samples of a grocery list so today I will give you both. Keep in mind that not every week is perfectly healthy for us (we do like splurge once in a while) and what healthy is to us might not be to you. I always like to stress that but sticking to the basic food groups is always the best way to go. If you like to meal plan than you pretty much should know exactly what you need to buy for groceries. A basic grocery list is all that is needed when getting started to create your healthy grocery list because it’s just a list. Nothing more, nothing less. If you don’t know how much your grocery budget is or should be that is where you should start before rushing to establish your healthy grocery list. Just like good food takes time to cook grocery shopping also takes time to ensure you pick the best food products you can. Note I didn’t say expensive either. I only say this because depending on your health needs you may need to spend more or less money so it’s important to have somewhat of a concrete amount that you can spend when you grocery shop. 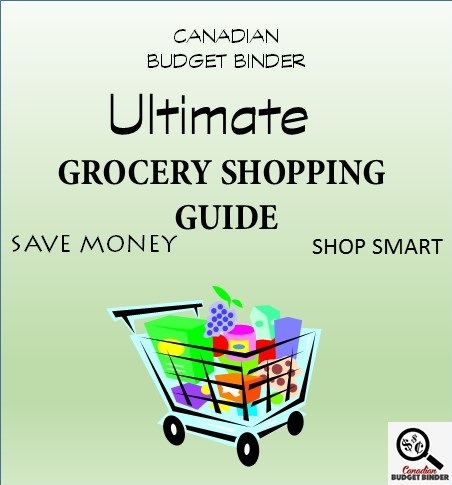 There is no special number that you will find online to tell you how much your grocery budget should be. That is UP TO YOU! You know your debts and how much money you earn so do the math, create a budget and the numbers will fall into place. Below is a sample of some healthy grocery list ideas that we would typically purchase. We may bot buy all of these items in one grocery shop but you will get the idea. 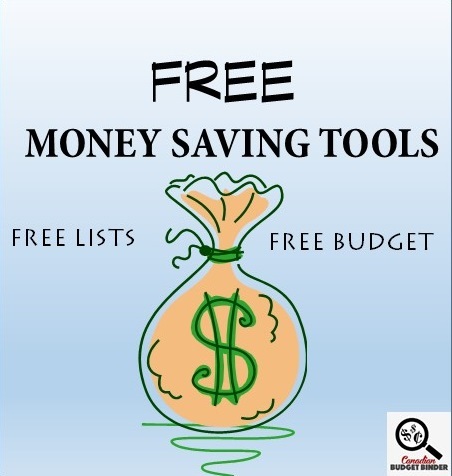 I’m the King of Lists and if you want to download the list I have in the photo above you can easily do that by downloading and saving the free template grocery list which you will find on my Free Money Saving Tools page. 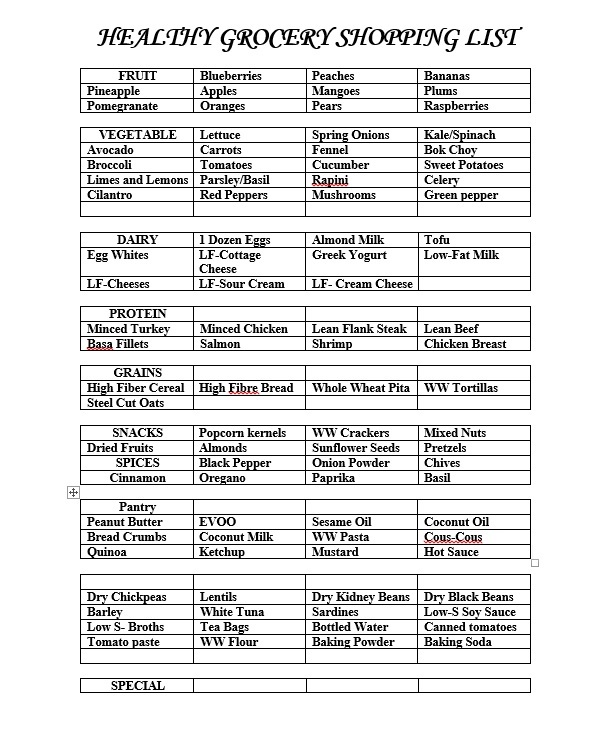 You will see a meal plan and grocery list all-in-one that you can edit and print. This is what we start with each week along with the weekly grocery flyers. We are then able to create our meal plan and grocery list around sales of the week to help us stick to our $235.00 a month grocery budget for 2 plus a baby. If you are as semi-organized as we are you will already have your pantry and freezer lists up to date so you already know what you have in stock. This makes creating your healthy grocery list that much easier because now you aren’t buying doubles or running out of products when you need them when preparing a healthy recipe. Healthy eating for us is based on the Canada Food Guide but for some people it may mean you have products you can’t eat for whichever reason. Such as if you are only able to buy gluten-free products than you will adjust your healthy grocery list as needed. For this reason you know what you can and cannot purchase based on your own health requirements. Just because you want healthy eating to be part of your lifestyle it doesn’t mean you have to bust your budget to buy the most expensive products either. Where you save in one area of the grocery store you can gain the rewards in another. Don’t pass by the reduced rack without a quick look to see what bargains you can find in the produce, meat, dairy and bakery departments. When looking for healthy products you want to stay away from saturated fats and enjoy the good fats because we still need fat in our diet. It’s very important to always read labels on products you buy so you understand the nutritional values and can see the ingredient list. The top ingredients are the first on the list so be aware of how much fats, sugars and salts are in those products. I found an excellent website called Health Castle made up of dietitians which is great because I’m not one and wouldn’t have been able to tell you about types of fats like they can. I know about them but it’s one thing to know and another to teach. If you are ever unsure your family doctor may be able to give you tips or your works benefits might even allow you a budget to see a dietician so don’t be shy to find out and use that benefit. The article Fats 101 and How to tell the Good and Bad Fats apart is a great post to learn more about what you can and shouldn’t be eating in terms of fat. Below are two healthy fats we should enjoy in our diets while eliminating or limiting saturated fats which are no good for us. Monounsaturated fats (MUFAs) lower total cholesterol and LDL cholesterol (the bad cholesterol) while increasing HDL cholesterol (the good cholesterol). Nuts including peanuts, walnuts, almonds and pistachios, avocado, canola and olive oil are high in MUFAs. Buying bigger lean cuts of meat which generally are cheaper to buy and creating portions will leave you more money to spend on the other categories such as dairy, grains, produce etc. If your budget doesn’t allow you to buy the leaner meats trim the fat if you see any from the cuts that you do buy. This is what we do because we really don’t need all that fat in our diet. We also tend to you cooking sprays and healthy oils like canola oil or extra-virgin olive oil over vegetable oil to cook with. Most processed foods that are deep-fried are likely made with vegetable oil so make sure you read the labels. We do prefer butter over margarine so we do purchase butter to use in moderation. The key here is to know your prices and do the math. If it’s worth the savings buying the bulk item you might want to consider that. Having a frugal budget means watching where the money is going so creating a shopping list for healthy eating means we eat what is in season and on sale. Loading up on vegetables and fruits will help keep your grocery list a healthy grocery list. What people tend to avoid is the over-processed foods that add no nutritional value to the diet. You are pretty much wasting money when you buy these products. Bulking your diet out with healthy foods such as beans, nuts or even frozen vegetables will help when you create casseroles, stir-fry or other one-pot meals that you want to stretch over the course of a few days. When buying condiments keep in mind the salt content because many products are full of sodium which is not good for the healthy eater. We also like to watch for sugar in condiments and opt for low-fat or fat-free products when possible but know that we don’t have to compromise taste. Healthy eating doesn’t mean you have to eat fat-free it means eating in moderation. In a processed world many of tend to eat too much food and are not as active as we’d like to be. Portion sizes coupled with healthy choices on your plate and snack-time will make you a happier person in the end. I’d like to be able to make bread and tortillas all the time but I just don’t have that time. When I do I try to use whole-wheat flour if I can or add other grains and nuts to up the nutritional value. High-fibre is important to us so even our breakfast cereals we tend to stick to types with wheat and fibre. My wife likes steel-cut oats so that is what she typically will eat for breakfast along with some toast, fruit and yogurt. Snacks will make their way into your shopping cart because as much as we all want to just shop the perimeter of the grocery store they are getting smarter with marketing. You will now see along your perimeter shop all sorts of treats strategically placed in your way. If you want to buy snacks stick to unsalted pretzels, plain popcorn and nuts. Nuts are great on their own, in salads or in a stir-fry . Sometimes we might cut up whole wheat pita and toast it in the oven for a snack to dip with our favourite Greek Yogurt or hummus dip. I won’t lie and say we don’t go down the middle aisles because WE DO. What we try and do is stick to the meal plan and healthy grocery list that we created which makes all other products null and void. It’s just our way of trying to block them out and although it doesn’t always work that is our plan and we’re sticking to it. You have to be armed with a plan when you step foot into the grocery store. Probably the easiest type of shopping for healthy foods is going to the market where we find all sorts of healthy foods which helps us to stay away from what we don’t want. Stick to the perimeter of the grocery store or only get what you need down the aisles. Read product labels for nutritional values and ingredient lists. Enjoy healthy eating and make it a lifestyle change not a diet! What other tips can you add to create a healthy grocery list? 2x Whole Wheat Premium Plus Crackers $3.49 each Ouch! Weekly Overview (your final thoughts): We spent more than anticipated this week because of the Super Bowl and I wanted to bring some stuff to my friend’s when I went over. I hate going empty-handed. Other than that we stocked up on cheese and the rest was mostly vegetables and other bits and bobs that we needed. I have yet to re-stock the beans, lentils and pasta that we had to throw away. Not much left to work with this month. The only thing not on our grocery list that we bought was the cheese as we didn’t know it was on sale so we grabbed it while we could. Did some shopping in some odd places this week and found better deals than just the student discount I’m relying on. The Westons outlet, we just happened to be in Kingston and stopped in because we were out of bread that we usually buy in he U.S. Chapters we happened to find the seasoning while we were killing time waiting for an appointment. We often buy the mixes because I can’t quite get the mixture right from scratch, but generally it costs a lot more. Glad to have found this clearance Christmas item. Walmart stocks the light cheese, RCSS does not, so PM isn’t worth it even though they are finally stocking some of the Armstrong cheeses. An ok week. Hope for more down the road, but the fridge looked pretty bare even after this trip, so we will see. The Weston’s outlet is classified as “stale” bread, but their version of stale is still within the timeframe the grocery stores offer. It isn’t what’s on the line that day, just what didn’t get distributed to the grocery chains. You never know what is going to be available there, but the prices can’t be beat. The 50 cent items tend to be product that expires in 2 to 3 days. Mandarin gel is basically jello with mandarin fruit in the bottom. My son didn’t care for it much, but I don’t mind it. Apparently he doesn’t like fruit in his jello. I hadn’t realized he never had it that way. I grew up with it that way so no biggie. I didn’t expect to find anything when shopping at Chapters. We really went there to buy books on their bargain rack for next Christmas. We found 4 of those too, but they came from the gift budget. After trying the spice mix, we really like it. I sort of wish I had bought a second. You just never know, I hate buying too much just in case it isn’t any good. Oh ok so that’s even cheaper than getting bread with pink stickers then. Ah ok.. I know what you mean about the Mandarin gel.. it just doesn’t sound appetizing to me either. I agree if it’s no good then you can try to return it but most people don’t. I didn’t want to HAVE TO buy anything this week for groceries because I overshot this week’s budget already last week! However, we ran out of some things we really needed for our meals (ie. olive oil to cook with, raisins for our homemade breakfast cereal, etc). In addition, it seems my husband REALLY needs his large bag of mini chocolate bars lately (at 10 bucks a crack!!) so what can I say…except that I’ve had a few of those mini chocolate bars too (but very few). We’re on a run of too much junk food lately I’ve told him (notice the Lays chips every week?) but he’s in denial & when chips are in the house, I WILL eat them, so I’m to blame too. I still need to buy some more meat but I guess the budget will be what it will be. I suppose if it ends up being say $300/month, that’s not the end of the world. We can afford it. I like how I’m feeling on this new diet so I want to continue eating this much more unprocessed diet (except for the chips & chocolate bars!) along with some meat once a day usually at supper. I’ve even been making my own bone broth for homemade soups. Who knew you had to PAY to get bones these days from a butcher or farmer? I’ve clearly been out of the loop on these things for a while. What an excellent price on the eggs. Good for you. You didn’t spend too much this week which brought you under budget. I like weeks like that. 🙂 Why does he NEED them? Is there no other snack he fancies? I get an allowance for my beer and nuts.. although I haven’t bought nuts lately as Shoppers have hiked the price too high for this boy. It’s ultimately up to you whether you continue to buy processed foods like chips and chocolate bars, it’s your budget. If it aligns with your goals then great but if not then find alternatives so you aren’t spending money you don’t have to spend. Regarding my hubby & his chocolate bars, it’s kinda like he wants what he wants when he wants it! We don’t buy that stuff usually when we grocery shop because we know we don’t need to be eating it–& if we have it in the house, WE EAT IT! So in terms of snacking, we decided that if we REALLY want something in the moment, then we have to get in our car & go to the local store to buy it (not far to drive; couple minutes). Usually this is enough to deter us from eating junk! Lately though, he’s bored I think (although he says he happy just doing “nothing”) so he eats out of boredom when he’s watching TV. We use to snack on nuts a lot too but not down here for some reason. The junk food/processed food just isn’t something we want to be consuming a lot of bcz it’s not healthy & it tends to get addicting…which leads to weight gain. So it throws a little wrench into my budget when I don’t expect us to be buying more chocolate bars but we can afford it. We just don’t need to be eating it regularly–which is what has been happening. We are buying the chocolate bars at the cheapest price we can find though so that’s good. I hear you about the cost of nuts & food everywhere in general. Boy the prices just keep going up, & up. Disheartening but just real life. By the way, what do we do with the ballot # we’re given each week? You write down the number and if your number gets chosen you win an envelope of Canadian Coupons. In the event you are not Canadian you can donate them to another player or ask me to pick again. 🙂 I think the winter really does get the best of us as we are indoors most of the time. In the summer I find I am more active and not bored. Weekly Overview (your final thoughts): Well after the sorry start last week I came in under for the week and it has pretty much balanced over the two weeks. The pasta is on sale this week as is the cheese. I have some already but I plan to stock up a little more on those. Pasta can make a very nice frugal meal here!! There are a lot of things I can do with the cheese as well. Add in a small pack of ground beef frozen into a couple of very small packs and some half price sausages with the chicken already in the freezer and we can eat nicely within the budget. I can do a little baking for treats with what I have in the house and things are looking good here!! It just happened that Foodland had them on sale that week. I didn’t even realize until I had them home but I used 6 of them to make the potato cheese omelette for the four of us and it was lots! I do buy the turkey ground especially. I can get a brand that runs $.50 cheaper than the Compliaments at Foodland, it’s a local brand but I splurge sometimes and pay $4.49 a pound for it. Ground chicken and pork I watch for the stickers. I’ve gotten the ground turkey the odd time stickered too. I’m getting more cheese at the sale price as we do love our cheese and I can do so much with it. That block I got last week for nine dollars and change was a decent deal for the price as it was 700g… Not that it lasted around here. The good thing about cheese bars is they will last in the refrigerator for months. We never bother freezing cheese because we eat it up. If it ever did get a bit of mold just slice it off, easy! By the sounds of it the cheese wouldn’t last long in your house either. I like the pork, beef, turkey and chicken to make meatballs but I need the pork mix. Do you have a big freezer as well? I have two, an older 12 cu ft down in the basement and a 10 cu ft in the kitchen. We need to have at least one as we have an all refrigerator… Both freezers need a defrosting so I’m trying to get it down to almost one so I can use the coolers and the other freezer to defrost one and then shift everything to the clean freezer to do the second one… I hate having to go to the basement freezer….I’m not a fan of our basement at all….. it’s nasty down there!! This months staff coupon is receive 80 airmiles wub $40 o more!! So I was able to use two coupons so far last week on discount Tuesday and hoping to use another one this week and another next week, gonna take advantage of it as much as I can!! I do think that my grocery deals and purchases would be different if I didnt work there. But not too much as I didnt really know the sales agead of time or any special promos when I was on mat leave. No bum rashes yet, I bought it as a just incase, we think the canned fruit can be hard on her sensitive skin so we are foing a process of elmination of what gives her a rash. We just have been giving her tylenol and advil for teething so far. She only has teo bottom teeth so far. Camilla seems to be really popular. Let me know if it works for you guys! My shoppers emailed milk coupon was $3.89 for any 4L milk so after deposit, fees and taxes it is $4.20!! A super good deal! He’s been using the Camilla lots lately… and we’ve given him Tylenol as he’s eating his hand off poor guy. I don’t like to see him suffer like that. That was a great deal from SDM wow! How are his teeth lately? Hope he cuts them soon!! I was able to buy 30pk Camilla and 30pk Cold from a buy and sell fb page for $5!! never opened or used! the 15pk Camilla at my work is over $10 so we will try it next time little miss is teething. My gf used to give her little man Tylenol and advil on a rotating of times so one would wear off and the other would kick in without much pain felt by him when the teething days were bad. 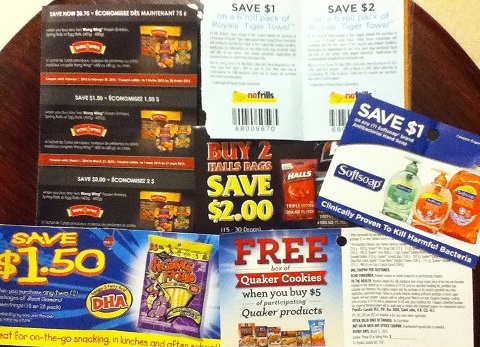 I am loving the SDM emailed coupons lately! Got another milk one emailed so I will use it before Friday. I thought this comment of yours was interesting, Mr. CBB: “We also like to watch for sugar in condiments and opt for low-fat or fat-free products when possible but know that we don’t have to compromise taste.” I’ve read before & then found it true myself by looking at labels on salad dressings, etc. that often the low-fat version has MORE sugar added to it than the “regular” fat version of a product. One reason for this that’s been suggested is to still make the product taste good so people will continue to buy & use it. By removing a lot of the fat, they end up removing a large portion of the good, natural taste that the fat provides so they boost the flavor again by adding sugar in various forms to make up for it. Check it out the next time you’re in the grocery store. I was shocked when I did this & I looked at several different products. For this reason, it’s probably better to simply go with the original “full-fat” version of a product or better yet, experiment with some make-at home recipes to find ones you like so you can control the amount & type of fat you’re consuming as well as any sugars (which often aren’t part of make-at-home sauces & dressings I’ve seen). We do for many products Leona and just enjoy them in moderation. I’m a bit of a label junkie as is my wife so we are always reading what ingredients are in products we buy. We are aware of all those silly names they give to sugars so we watch and if we don’t like what we see, we don’t buy it. You are exactly right about the fat-free and low-fat products and they don’t taste so good either. The wife likes the lower fat foods and tries to encourage me to drink 1% milk (nope) but I like my full-fat products. I have made my own mayo for example which is easy enough to do IF you have the time in the kitchen which I’ve been short on this past year. We make pretty much all of our own salad dressings especially in the summer. My wife even had me buy a lime tree because she’s a fanatic for them and it’s doing pretty well I might add. Great to hear about the lime tree! We also put in a lime & an orange tree here outside at our Arizona home & we picked our first limes this year. So tasty & satisfying to grow your own stuff. I’ve also been plucking away at my poor little indoor basil plant every chance I get because I LOVE fresh basil in recipes. I told my husband we’re gonna have to buy 2 of them next year so they have time to replenish their leaves before I strip them bare! I recall reading about you & your wife making basil pesto frozen cubes. Do you end up with a garden full of fresh basil in summer or do you grow your basil indoors? I’ll have to go looking for that older post of yours to refresh my memory on this. I think this would be a good way to have plenty of basil on hand for cooking. I’ll probably start putting it in our breakfasts though if I do that! Mr CBB. Thanks for the tips. I think there’s no way out from having a healthy grocery list. And the reason why I have a list is for me to basically know how much I can afford to spend and to plan meals my family will have. I try to feed the family healthy food but it isn’t always easy. There are still some processed things I get but I’m trying to wean hubby and the boys away from that stuff as much as I can. Hubby has his applesauce all the time. Getting them to eat their veggies can be an issue. The younger boy especially, has concerns about GMO’s in the veggies you buy so doesn’t go for a lot of it. I am waiting for the Farmers Market to open in the spring so I can get goodies there. Convenience foods here tend to mean frozen veggies that I can add to casseroles and such to up the amount of veggies I get everyone to eat. I have been buying sunflower oil lately and it has been working out nicely so long as I remember to use the exhaust fan over the stove, it has a low smoking point and has set off the smoke detector in the next room…. Like you I buy butter over margarine…I can understand the ingredient list there. I try to buy healthy but I need to be sure the food will be eaten too and that is the biggest problem I face here. It would be so nice if I had the room to grow a lot of the veggies we could eat..then we would know what is or isn’t in the food. I agree with you Christine about wishing we had the room to grow a big garden so we knew what we were eating. And I would also wish for someone to help us take care of it! I love gardens but they can be a lot of work too. 🙂 Also, just curious why you like to use sunflower oil for cooking, given it’s low smoke point? The sunflower oil goes back to my son’s concerns about GMO’s… Things like corn and canola are GMO products. If you get one labeled vegetable oil it is likely a blend of those as it is so cheap to make. Price wise the sunflower is on par with the others but not as likely to have the GMO’s…we hope. It’s not a big deal to run the fan for a bit….if I forget to turn it on in time we test out the smoke detectors!! Lol!! At least we know they work!! I found a thing on Pinterest to make pots for growing what ever using landscape fabric!! It looks super easy so I’m hoping for a sale on that so I can make some. Last year I grew a couple of tomato plants in my big flower pots but I don’t like using the same pot for a plant two years in a row and these would be so nice for some tomatoes and such!!! I’ll have to get back to let everyone know how they work out!! That idea with landscape fabric sounds so interesting Christine. We have a ton of that fabric leftover in our garage. Do you mind posting the link to that Pinterest site so I can check it out too? We want to start a garden this summer for the first time so I’m looking for idea. You’ll have to let us know for sure how it works & I’ll do the same if I do it too. We have a hard time buying healthy foods. We are guilty of taking the easy way out for the cheaper items. This last week I made a batch of cheap, beyond simple cookies with only two ingredients: 2 mashed bananas and 1 cut of certified gluten free quick oats.The cookies were yummy & healthy and I was sharing this with my mother-in-law over lunch on the weekend. She suggested I check out recipe books from the war years…when luxuries like sugar were heavily rationed. I think I will do that! I rather like recipes that don’t cost an arm and leg to make but are more importantly not full of a bunch of stuff that I don’t need in the recipe and nor can I pronounce. NONE – OUR NEXT USA SHOP WILL BE FEB 21st! This also means that with $190.00 to start FEBRUARY less $55.00 transferred to the various savings reserves & an additional $60.00 saved in our US grocery reserve, we opened the month of FEBRUARY with $75 available, less an overage of $9.31 carried forward from January, PLUS we have spent $44.82 on our groceries so far this month and have $20.87 REMAINING AVAILABLE for the month in our CANADIAN budgeted grocery funds. We also have groceries that have been purchased using points redemption(s), rather than the budgeted cash, in the amount of $9.67. If our budget is truly sufficient, when we reach December 31st, those funds should still be available in the form of unused cash. It’ll be interesting to see if they actually are. I made those cookies too after you mentioned it. We weren’t big fans of them because we were missing the fat. We love cookies but I can see how they would be popular for those that want simple and less of the junk that comes with cookies and treats that we should only eat in moderation. Haha.. you like the party to go on and on.. might as well! 🙂 Yes it will be interesting to see what happens in December with the money in that account. With so little left for the month will your US shop compliment what you might not be able to buy for the rest of the month? Saturday – 14th – Valentine’s Day! That menu plan looks tasty to me! We are bad with buying unhealthy stuff. This month we’re eating down our freezer/pantry to recover from our unhealthy budget buster of a January, so maybe we’ll lose the taste of junk. We have similar grocery rules though to keep our grocery spending in budget.